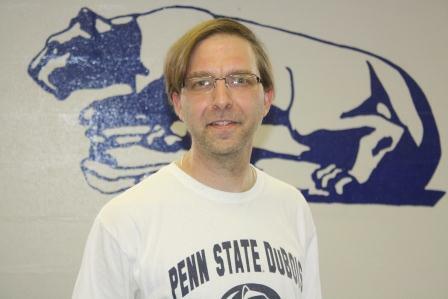 DUBOIS – There’s a face that is being seen around campus at Penn State DuBois for the first time. It’s that of Mathematics Instructor John Tolle. Though he has taught on campus for a few years now, this is the first time anyone here has seen the face under the beard. 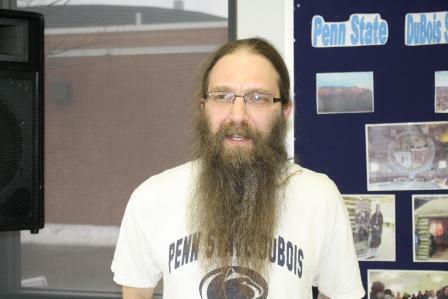 Tolle volunteered to have his hair and beard auctioned off in support of THON during the annual Hair Auction, organized by the DuBois THON Committee. He raised over $1,600 for the cause, which supports pediatric cancer research. Tolle’s beard extended to the middle of his chest, and his hair came down to the middle of his back, worn in a ponytail. He said he’s had the beard for 18 years. So, as the crowd chanted, “Bieber, Bieber,” Chancellor Anita McDonald had the honor of making the first cut, removing the ponytail with one snip of the shears. Student Alice Gyamfi, who is also a licensed beautician, did the rest of the work. As the hair fell to the floor, the new John Tolle began to emerge. Gyamfi gave the crowd what they wanted: long bangs hanging over Tolle’s eyes, parted to one side, and a clean shave. The donations for Tolle’s hair came from two different camps. A total of $1,452 was raised by those who wanted to see the hair go. Another smaller, yet loyal group raised $201 to try to save the beard. Since the preservationists did not raise more than the pro-cut crowd, however, the beard and hair met their demise. Students Steve Zanoni and Joey Schaeffer also volunteered for the hair auction, raising $201 and $278, respectively. To date, the DuBois THON Committee has raised $15,310 this year. The DuBois THON Committee supports the efforts of THON that reach throughout all of Penn State. Money raised by THON is donated, each year, to the Four Diamonds Fund, a leader in the support of childhood cancer research. This year, THON is scheduled to take place from February 17, through February 19, at the Bryce Jordan Center at University Park. At that time, student dancers from across the university will attempt to stay on their feet for 46 hours in support of efforts to find a cure for childhood cancer.